Rep. Jerry Nadler (N.Y.), the Democrat who is set to lead the House Judiciary Committee once the new Congress convenes next year, says he doesn’t think the appointment of Matthew Whitaker as acting attorney general is legal. “I don’t think an attorney general can be appointed without the advice and consent of the Senate. His appointment is simply part of an attack on the [Russia] investigation by Robert Mueller, the special counsel,” Nadler said Sunday on ABC’s “This Week,” adding that Whitaker’s appointment is “part of a pattern of interference” and “attempted obstruction” by President Donald Trump. Whitaker, who is now overseeing the Mueller investigation after Attorney General Jeff Sessions stepped down, has come under fire for expressing deeply critical views of the probe in the past. In 2017, Whitaker also argued that an American president had such broad executive power that the person could order any federal investigation be stopped without obstructing justice. The Justice Department is expected to publish a legal opinion in support of Matthew Whitaker’s installation as acting attorney general as early as Tuesday, a person familiar with the matter said, following questions about whether he can legally serve in the role. The department’s Office of Legal Counsel is expected to say that President Trump had the ability to appoint Mr. Whitaker, the person said. 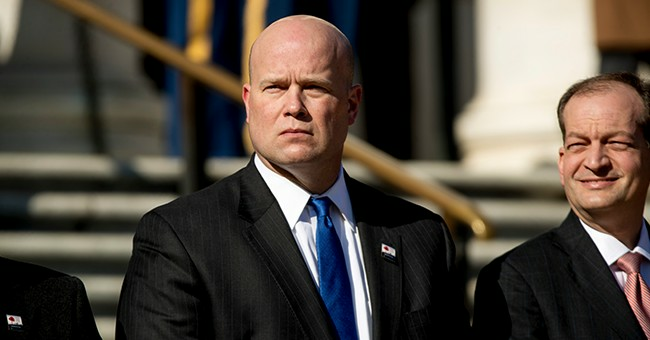 Mr. Whitaker took over last week as an interim successor to former Attorney General Jeff Sessions when Mr. Sessions was ousted by Mr. Trump. The opinion is expected to support the Trump administration’s position that the president’s authority to tap Mr. Whitaker is affirmed by guidance the office issued in 2003. At that time, the office concluded that President George W. Bush could name a non-confirmed employee of the Office of Management and Budget as the agency’s acting director. The OMB director, like the attorney general, is a principal officer of the federal government. The 2003 opinion avoided that problem by defining an acting director as an “inferior officer,” who under Supreme Court precedent doesn’t require Senate approval to be appointed. The Office of Legal Counsel’s opinion is unlikely to quell the debate over Mr. Whitaker’s leadership. The appointment could still face a legal challenge that, if successful, could invalidate actions Mr. Whitaker takes as acting attorney general. Officials in acting capacities are often viewed as placeholders who don’t pursue policy initiatives until a permanent official is confirmed by the Senate. As for recusing himself, which has been another call from Democrats, from the Mueller probe, Whitaker pretty much told them to shove it; he doesn’t plan on doing so. It’s bound to be one of many fights the Trump White House is going to have with the incoming Democratic House.